Long story short but I met a friend outside of Safeco on Tuesday night right around first pitch of the Mariners-Jays baseball game. He was running late so I was loitering around for about 15 minutes. I always knew that a lot of local Canadians would go check out the Jays when they came to town but I really figure that it was similar for every team (i.e. Michigan folk check out the Tigers, Bostonians check out the Red Sox, etc.) As I was waiting for my friend, I was shocked at how many Toronto shirts were going through the turnstiles. If I could venture a guess, it seemed like 60 to 70% of the people going in were Jays fans. Realistically, I know 60 to 70% wasn’t really possible for an out of town team but I noticed and wondered how I validate that observation. I’ve often mentioned to people that there sure seems like a lot of Canadians live in the area but have never been able to validate my theory. As you can see the Blue Jays are a big draw for the Mariner’s compared to other games on the same day of the week. 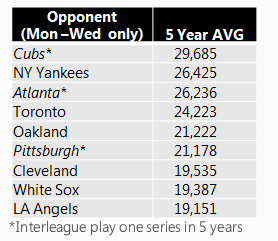 Over the last 5 years, the Jays have drawn 23% over average attendance for Mon-Wed games. This year they drew 52%, 74% & 79% higher for their Monday, Tuesday and Wednesday games. The Mariners-Blue Jays Tuesday and Wednesday games were the highest attended Tuesday and Wednesday games of the 2013 season. Monday was only the second highest Monday game attended…with opening day the highest attended Monday game of the year. Digging deeper: Excluding interleague play, only the New York Yankees have drawn more fans than Toronto on Mon-Wed games. As you can see from the table to the right, Cubs & Atlanta have drawn better than Toronto over the last 5 years. Those teams have only played one series in the last 5 years and there is a novelty factor in trying to see all teams in the league. I think this proves my point here, there is a huge impact on attendance when the Toronto comes to town. This is a mix of Canadians in the area as well as our brothers and sisters from Vancouver making the trek. I would love to know what % is coming from where but until the Mariners turn over their database to me, I don’t think it is going to happen. 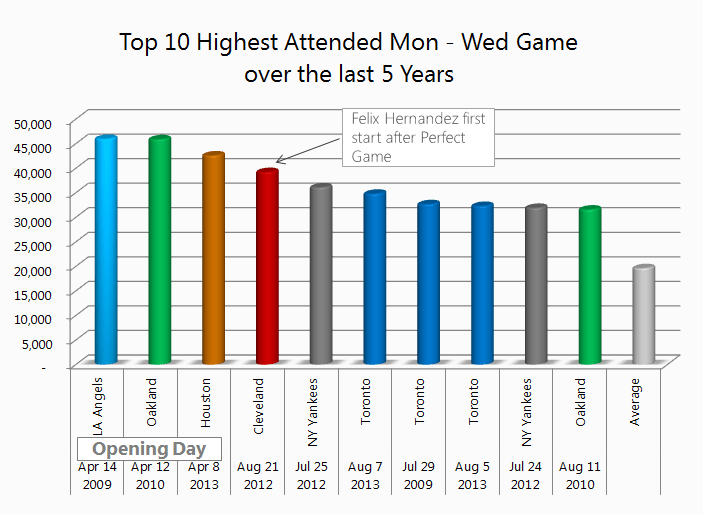 To wrap it up, I looked at the top 10 highest attended Monday through Wednesday games over the last 5 years and remarkably, Toronto has 3 out of the top 10 but when you remove the 3 opening nights that fell on a Monday, Toronto had 3 of the Top 5. I knew Canadians would often attended the Blue Jays games but I never expected the impact could be so significant. With 7 Canadian NHL teams coming through Seattle a year, plus BC and Alberta teams coming through multiple times, we are looking at a guaranteed 10 sellouts a year which is already more than 8 teams in the NHL. This will be a distinct business advantage an NHL franchise in Seattle when comparing themselves to other teams because Calgary, Edmonton, Ottawa and even the Leafs do not draw well on the road in most US markets. The Canadian impact could be a lot bigger than any of us could have predicted. Great story on this John. Do you know how many Candians live in Washington? (dual citizenship) Specifically Snohomish, King and Pierce counties? Unfortunately I do not. I’ve tried searching for this multiple times. It feels like a lot as several people I work with are from Canada. Several of my Canadian hockey playing friends have mentioned that they work in the US to get US money but live in Seattle because it is close to home (Vancouver). I’ll try one more time. GREAT ANALYSIS!!!! This is a valuable assessment and bodes well for anyone considering buying/moving a team to Seattle. This validates what we all suspected, Canadian fan support will contribute to the success of a NHL team in Seattle. I had family from Vancouver and Victoria in town this week and they plan their annual summer visit to coincide with the Blue Jay games. The more information we have leads to a better understanding which then leads to more questions. How many local Canadian fans are there vs Canadians who travelled to the game from BC/Alberta? While I suspect that Vancouver, Toronto, Montreal games in Seattle would be a scalpers dream come true, will Ottawa, Winnipeg, Calgary, Edmonton be able to draw as well? Would Vancouver/BC businesses consider season tickets (suites) to entertain their clients? Would Kelowna or Kamloops Junior Hockey fans include a Seattle NHL game while their teams are in town playing the T-birds/Silvertips? How many of the 10.2 Million visitors to King County (Visit Seattle) are Canadians? There is lots to like about the potential of NHL Hockey in Seattle, keep up the good work. We are headed in the right direction. Perceptive article. I’m wondering how you came up with only 10 sellouts based on the Canadian teams? Also, do you have any idea on how the ratings are for hockey Might in Canada on CBUT/CBC? It must be decent in Seattle with CBC on basic cable. – Calgary, Edmonton and Vancouver (all in the Pacific division) would theoretically travel to Seattle 2 to 3 times a year. Conservatively I assumed only 6 visits across those teams and all would sellout. – Winnipeg would travel to Seattle at least once but every other year would technically travel twice. I assume that is one sellout as well. – Montreal, Ottawa & Toronto would visit Seattle once and certainly Montreal and Toronto would sellout and I assumed Ottawa would as well but to be honest, I am not sure if they would be that big of a draw. Ratings wise is really challenging. I don’t think Nielsen reports on CBC but having NBC and CBC dilutes any ratings reported. I’ve never seen Seattle CBC ratings reported anywhere. In an unscientific poll of my followers during the playoffs, the responses were almost 50/50 down the middle with a slight nod to CBC coverage. Really insightful stuff, John. I wouldn’t have guessed the Blue Jays would be such a draw in Seattle. Do Canadian baseball fans tend to be Blue Jays fans regardless of what part of Canada they’re from, seeing as they’re the only team north of the border? There’s no doubt in my mind an NHL team in Seattle would sell out its games against Vancouver based on proximity. Montreal tends to be a big draw everywhere, but would it be a bigger draw in Seattle than anywhere else? Even with the data you present here about the Mariners, I have the same skepticism about the Leafs. I guess, like you said, a big part of the answer comes down to whether the Jays fans at Mariners games reside in the Seattle area or they come over from Canada. I have no doubts about Toronto and Montreal selling out their one game a year but can understand someone questioning that assumption. I work in Tech and there are a ton of people from Toronto via a tech pipeline from Waterloo. Now I could be living in a bubble but Leafs fans are all around me. The Leafs and Habs draw 93% to 95% capacity on the road. This is one of my earlier posts on the Attendance draws on the road: http://www.3rdlinegrind.com/2013/02/road-attendance-volatility- n-nhl.html Hopefully it is understandable as it was one of my early posts when I was still learning. I think the bigger question would be Ottawa & maybe Edmonton. With one game with the Sens a year and Edmonton having such a young core of Canadian talent I think they are a big draw. Real success would be turning more people on to the sport that may have never seen a game before but it is nice to know that we have more Canadian fans than we expected.